"Permit are not meant to be caught on flies. I know this for a fact: Over the years, countless dozens of them have told me so." In the entire world, there is no fish on the saltwater flats more difficult to catch on the fly than the permit of the western Atlantic. So elusive is the crab-eating species, and so difficult to catch on the fly, that some seasoned fly anglers can go years and years without catching a single fish despite ample opportunity to cast to them. But nobody ever told the late Del Brown that, the Californian who spent up to 100 days a year in the Florida Keys chasing the species that his memory is now synonymous with. Designer (along with guide Steve Huff) of what is undoubtedly the greatest fly ever conceived for catching permit, the crab-imitating Merkin with its few strands of rubber, some Antron rug yarn, a few hackle tips and some lead dumbbell eyes, Brown made it his life goal to excel at catching permit on the fly. Specifically, Brown wanted to catch at least 500 of these fish in his lifetime. By the time of his death in 2003 from a heart attack at the age of 84, Brown had actually caught 513 permit on the fly. Because of his impact on the sport, the Del Brown Permit Tournament has been held in the late angler's honor since 2001. Aimed at preserving the fisheries of the Keys that Brown loved so much, winning the event is difficult and a great honor in the saltwater fly fishing community. Past champions have included a number of well known saltwater fly anglers including the late Dr. Jon Ain and Andy Mills, the former U.S. Olympic skier who is widely regarded as one of the best tarpon fly fishers in the world today. With a backdrop of good fishing weather last week in the Keys, this year's Del Brown tournament was held out of Key West, Fla., from July 14-16. When the tournament's run was over, the 2014 Del Brown tourney had crowned a first-time champion, Nathaniel Linville of Key West. During the three-day event, Linville, fishing with Capt. Aaron Snell, landed and released five permit for a total of 800 points. Linville also landed the biggest permit of the event, a sizable bruiser that measured 32 inches to the fork in the tail. According to Kevin Jarnagin of Blue Heron Communications, Linville caught his five permit on one-piece Hardy ProaxisX fly rods. Linville reportedly used a combination of eight-weight and a nine-weight models that measured eight feet, 10 inches. First runner-up for this year's event was 2013 defending champion Greg Vincent of Grand Bahama Island. Fishing with Capt. Justin Ray, Vincent, who has won the tournament three times, landed and released two permit for a 300-point total. Vincent had been seeking his fourth title in the event's history. Second runner-up in the tourney was Ivar Bolander of Santa Rosa, Cal. Fishing with Capt. Steve Friedman, Bolander caught and released one 27-inch permit, a fish that was good enough for 150 points. Overall, there were 15 permit caught and released during the event according to tournament organizers (www.delbrown.com) and various published news pieces. 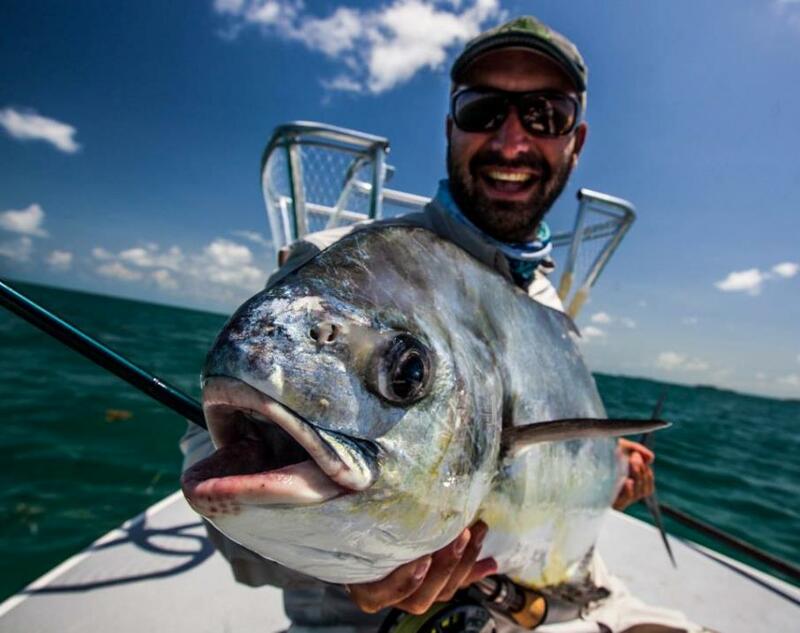 During the event, permit must be caught on flats in water less than eight feet in depth; caught on single hook traditional flies only; under International Game Fish Association (IGFA) rules for tackle and leaders; and boated, measured, photographed and released alive. The point system used to determine a winner is based on the length of each caught and released permit. In addition to the tourney's permit fly fishing results, a fun-fishing catch-and-release category for bonefish was added to this year's Del Brown event. Nick Worswick of New York, N.Y., won the inaugural competition. Fishing with Capt. Mike Bartlett, Worswick caught and released six bonefish for a total of 600 points. Finally, tournament organizers indicate that this year also marked the first time a female angler has participated in the event. Kat Vallilee, of Key West, caught her first permit on the fly ever while fishing on the final day with Capt. Drew Delashmit. Editor's Note: For information on permit or to make a donation for research into preserving the saltwater flats species, visit please visit the Web site for the Bonefish Tarpon Trust at www.tarbone.org.